Baked Melitzanes Saganaki is an easy appetizer made with fried eggplants, tomato sauce and two Greek cheeses: feta and kasseri and then baked in the oven. I first tried this dish at a restaurant in Kefalari, not far from Argos, in Peloponnese, which I liked. Before going to the recipe let me tell you a few things about some unique sites around Argos, which are worth visiting. If you are staying in Nafplio and have a car, it is only 12 km (about 15 – 20 minutes drive). Argos is the biggest town in Argolis and a major center for the area. It is one of the oldest continuously inhabited cities in the world with a history dating back to the Mycenaean era. The fortress of Larissa is situated on a hill and is visible from the seafront of Nafplio. The fortress of Larissa on top of the hill and the archaeological site of Argos with its theatre are worth visiting. However, we didn’t visit the fortress as it was closed due to renovations. Kefalari is a Village in Argos in Argolida in the Peloponnese Region of Greece. When our children visited us last year, we planned a daily excursion to Argos. We visited the ancient theatre of Argos and not far away, 3 km to the southwest we reached Kefalari and a couple more kilometres is the Pyramid of Hellenikon. We decided to visit the Pyramid first so that on our way back we would stop at the Church of Zoodochos Pigi or else the Virgin Mary Kefalariotissa, is built in a cave next to the river Erasinos, with lots of tavernas and beautiful scenery around it. We had lunch at the restaurant “Palia Istoria”, which is the closest to the stairs leading to the church. The food was delicious and the service excellent! The dish consisted of three layers: baked or fried eggplants, tomato sauce and cheeses. It was baked and served in a ceramic bowl, much deeper than the ones I used but mine worked well. The appetizer was called “Melitzanes Saganaki” and although technically the term “saganaki” is not correct, as sagani or saganaki is a frying pan with two handles and any dish make in that pan is called saganaki, I kept the same name. I tried to recreate this dish from what I tasted so I used Tsakonikes eggplants, made an easy tomato sauce, similar to Marinara Sauce but much simpler and added feta and kasseri, which both melt and make this dish creamy. The dish may not be exactly like the one we had at the restaurant but it turned really good and we enjoyed it. The dish is simple and versatile, so you can use any type of eggplants. However, if the eggplants you use are bitter, you can find instructions how to remove the bitterness in my recipe for Melitzanes me Tyria (eggplants with cheese). Of course, you can make your own tomato sauce and add melting cheeses of your preference. I baked them in six individual ceramic pots, 13 cm diametre but you can use one oven proof dish if you prefer. These can be made ahead, wrapped in cling film and freezed. If cooking them straight away, proceed as in recipe. If you freeze them, you do not necessarily need to thaw them but after preheating your oven, lower heat to 160 degrees C, (mine is fan forced), and cook them for more time, about 10 – 15 minutes to give some time for the ice to melt. Wash the eggplants and drain well. Heat a couple tablespoons olive oil in a non-stick frying pan. Cut the first eggplant into 1 cm round slices and fry them on both sides until golden. (Do not cut all of them all at once as they will oxidize (brown). Repeat with the second and third, adding more olive oil. Heat the remaining olive oil and sauté the onion until translucent. Add the tomato, fresh basil, salt and pepper and herbs. Cook for 6 – 10 minutes, or until most of the liquid evaporates. Season the eggplants with salt and pepper and layer them in six ovenproof ceramic pots of 13 cm diametre. Add 1/6 of the sauce and spread it on top of the eggplants. Add any leftover slices of eggplants on top. Add 1/6 of the feta (25 grams) on top of the sauce and finally add the grated kasseri, to cover the surface. At this stage you can wrap them in cling film and freeze to cook whenever you like. Preheat oven to 180oC and bake for 20 – 25 minutes or until golden on top. Note: Modern types of eggplants are not bitter but if the variety you use are bitter, you must first remove the bitterness and then proceed to the other steps. Cook for 6 - 10 minutes, or until most of the liquid evaporates. Preheat oven to 180oC and bake for 20 - 25 minutes or until golden on top. Eggplant and cheese…my favourites..this looks right up my alley, Ivy. Your Article is nice. 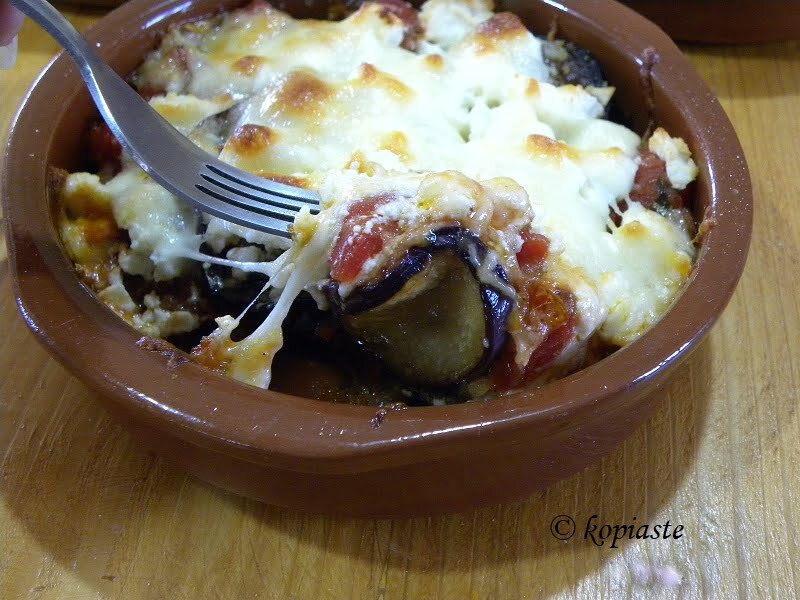 we are made simple eggplant and use a gas and used the oven.I love eggplant vegetable and I do not use another recipe.i read this post and next time I will try this dish and tell to how to make the dish.